NOA to the locals, North West Argentina is dazzling our Alan with its diversity – he’s seen frogs, ships, cathedrals and devil’s throats, to amphetheatres, ships, monks and much more. Check his stunning photos on our Facebook page. “NOA is a place to let your imagination soar and wonder, while you keep clicking your camera. As the plane touched down in Salta, I had to throw my preconceptions of a semi-arid state out of the window. Sitting 1,200 metres above sea level, a lush greenness greeted me along with a sub tropical highland climate, some 1,800km (1,000miles+) from Buenos Aires. And with Salta’s two football teams having been absent from the Argentine first division longer than Scotland from the World Cup, I was warming to the place. I was using Salta (pop 650,000) as my base and exploring the 200km road south from here to Cafayate. The first part was mainly tobacco and cornfields, with scatterings of goats, then we entered the ‘Quebrada de Las Conchas’ which means ‘Gorge of the Shells’. Millions and millions of years ago this had been part of the seabed. Tectonic upheaval after upheaval has created a geologist’s nightmare. It’s an artist’s dream though, as the energy has created the most amazing mix of rocks, colours and hues and forms. Cafayate itself was a pleasant surprise. A quaint town, popular with the Argentines and a wine producing area with its flagship wine Torrontes. I had never heard of it but now I know its a white wine. Strangely dry but fruity, and back in the UK I will be searching my supermarket shelves for it. After Cafayate I headed north of Salta to the Humahuaca Gorge. Here I found a fascinating blend of colourful scenery, history and pre-Colombian forts as well as stunning salt flats at over 3,000 metres at Salinas Grandes. This was carnival and it was great to see the locals celebrating in their unique style – my understanding was that you dressed up as the devil, behaved devilishly and then buried the devil until carnival came round again. Sounded like my kind of party. On the drive back to Salta we drove through an area of tropical cloud forest. I couldn’t quite comprehend that a couple of hours earlier I was on a high salt flat. All this is relatively unknown to most visitors. Yet it’s just a short flight from Buenos Aires, and Salta is only 10-hour bus journey from San Pedro de Atacama in Chile along a well-maintained paved road. There is a marked dry season (April-Nov) and wet season (Dec-Mar), as well as some great treks to look into. 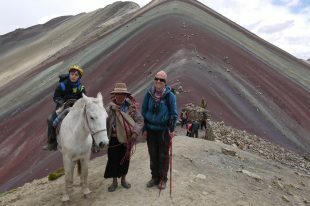 On leaving Purmamarca, on the final leg to Salta we stopped to photograph a rock formation known as the painter’s palette.